There are many different types of broth, but mushroom broth may be the most nutritious. Broths are often used as a base for various recipes, especially soups and stews. Why should you use mushroom broth over standard chicken or vegetable broth? The simple answer is that mushrooms have high content of antioxidants and minerals that help promote better health. Consuming more mushroom could reduce your risk of prostate cancer and other ailments. One unique antioxidant that was found in mushrooms is ergothioneine, which scientists are now beginning to recognize as a “master antioxidant”. It appears to have a very specific role in protecting your DNA from oxidative damage, something that you want more of. Here are 5 health benefits of mushroom broth, along with a simple mushroom broth recipe that you can use to start including more mushroom in your diet. Mushroom does not contain a lot of calories. Since mushrooms are comprised of about 80 to 90 percent water, the majority of the broth is comprised of water. They are also low in sodium. If you are trying to cut back on calories, try basing a few meals around mushroom broth. The mushroom broth is an excellent source of antioxidants. It is rich in minerals such as selenium, riboflavin, and niacin. These nutrients help protect your cells against free radicals that are known to lead to an increased risk of certain types of cancer. One study found that consuming mushroom broth could potentially reduce risk of developing prostate cancer in men, by more than 65 percent. 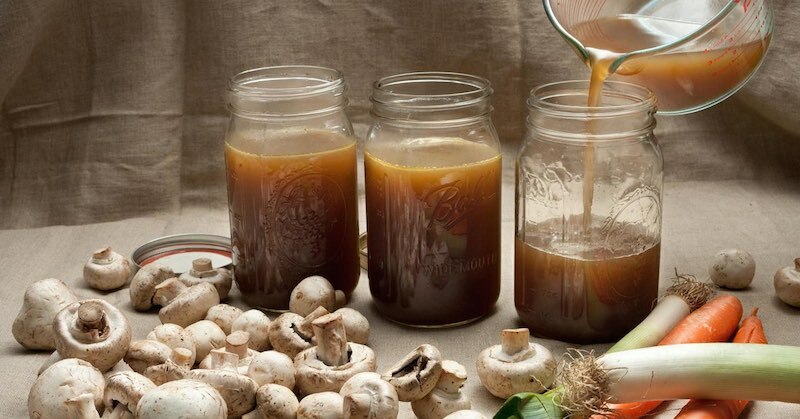 Eating mushroom broth will naturally help boost your immune system. This is especially true of mushroom broth that contains Shiitake mushrooms. These mushrooms are known to have a strong impact on the immune system. Mushroom broth contains a lot of potassium. Potassium is needed to help manage cholesterol levels and blood pressure. By including more potassium in your diet, you could reduce your risk of stroke and heart disease. Mushroom broth can also supply you with copper, which is useful for promoting heart health. As mentioned previously, mushroom broth contains antioxidants that neutralize free radicals. These free radicals are responsible for more than increasing your risk of cancer. They also increase the rate of aging-related illnesses, such as the degeneration of cells and cognitive decline. The following recipe provides a simple way to include more mushrooms in your diet. It combines the health benefits of mushrooms with the power of bone broth. Obviously, this is not the only way to prepare mushrooms, but it does offer an easy way to include more of these beneficial nutrients in your diet. Combine all of the ingredients together in a saucepan. Boil the ingredients for several minutes and then reduce to a simmer. Cover the saucepan and continue to simmer for 20 to 30 minutes. Strain the mushrooms from the broth and store the broth in a glass jar. You can use this broth for anything, from chicken soup to a stew. Mushroom broth is incredibly beneficial for your health. In addition to this recipe, search for other ways to prepare your own mushroom broth. You may also want to experiment with the use of different mushrooms. When you start shopping for mushrooms, buy organic. Mushrooms absorb nutrients from everything around them. This is why mushrooms are so potent. If you have not already included mushrooms in your diet, you now know the importance of these nutritious little foods. Start eating more mushrooms to reduce your risk of prostate cancer and improve your overall health.